Where it used to be that destination weddings weren’t really the norm, today more and more couples are seeing the benefits in this style of wedding. Often, there is a lot less stress involved, it allows everyone to enjoy a vacation tied in with the wedding, and it really makes the entire event that much more special, romantic, and memorable. If you’ve made the decision that a destination wedding is the right kind of wedding for you, and you’ve gone ahead and chosen the exotic and beautiful location of Thailand for the wedding, then it’s time to jump into the planning process. Even though you won’t have the same level of planning as a traditional wedding at home may entail, there are still some tips that you can use to help the planning go smoothly. Let’s take a closer look. When planning a traditional wedding at home, it’s customary to send the wedding invitations six to eight weeks before the big day. When it is a destination wedding, however, you need to give guests much more notice. They will need time to book vacation at work, book their flight and accommodations, and even save up for the trip. At the very least, you want to give guests at least three months’ notice. Before you send out the invitations, you can also look into group booking discounts at the hotel and airline you choose. Rather than staying in a hotel and then looking for an off-site venue to host the wedding, you can make your life a whole lot easier by looking for a hotel/resort that combines the two. This takes away any sort of transportation issues for you and your guests, plus you’ll be on-site to answer any questions the venue may have leading up to the wedding. Some hotels and resorts will even offer a wedding coordinator, which means all the work and stress is taken right off your plate and you’re left to just enjoy yourself. The Dusit Thani Krabi Beach Resort is a perfect example of just such a location. 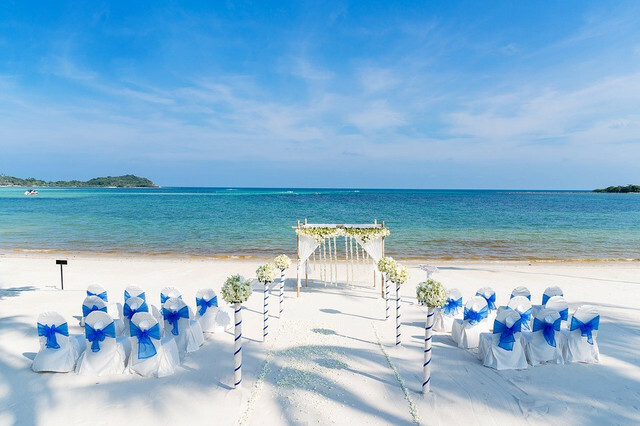 The resort makes a wedding in Krabi Beach easy and spectacular since they do the planning, look after all the details, offer beautiful grounds ideal for wedding photos, and give you the opportunity to add your own special touches to the day. Because marriage regulations change from country to country, you want to look into Thailand’s laws well ahead of time. If you have a wedding coordinator at your host hotel, they may be able to help you with this part of the planning process. Obviously, the wedding will be the highlight of the trip, but it’s important to remember your guests are on holiday. A nice touch is to plan a few group events that everyone can enjoy such as dinner at a local restaurant, a guided group tour, a shopping excursion in town, etc. This is just a nice gesture for your guests. By following these tips, you’ll ensure that your wedding and the entire trip is one that everyone will remember fondly.